ePASS TS Status 2017-18 – ePass Status TS Telangana online application form may not available for this year. please look at Ts state previous scholarship amount and student details mentioned below. Telangana scholarship offering for SC, ST, BC, Disabled and Minority welfare category students whose parental Income is less than 2 Lakhs per Annual economic year India April 1st to March 31st. Announces when budget released By state and central government For knowing This year tax slabs you may visit in. Parents who paid income tax Not eligible for Telangana scholarship scheme year. All you need to keep your scholarship registration number if you don’t’ have the number then. Check the forgot number on student services page. For More latest information Announcements, You can click on the services page because it’s especially for students. All other pages for TS / TELANGANA officials like district verification officers who are processing your scholarships by checking the photocopies of your certificate submitted at your college. ing things needed to check Telangana scholarship status from 2017 onwards. SSC pass Type & Hall Ticket Number. Academic year means the present or last year for the scholarship applied. Year of the pass of the Academic year. Students who wish to have ts epass scholarship must go through this write-up so that they are aware of the various facts about getting such scholarships. and dealt over here in details so read through this article. Scholarship eligibility clearly mentioned by the government that students must follow in order to have such scholarship which will relieve them from financial burdens to continue their studies. The annual family income of students who fall under SC and ST categories must be less than or equal to Rs. Two Lakh. Students who fall under BC, EBC and Disabled must have parental income less than Rs. One Lakh yearly. Students must have 75% attendance at the end of each quarter. EBC students who are completing Intermediate studies cannot apply for this scholarship. Students who are completing courses offered by open universities, distant education, category B seats in MBBS, BD are also not eligible. There is a definite Application process follow. It is prudent that the process is followed properly so that the application does not get rejected. hemselves to be qualified for the scholarship then they need to fill up a form for having the scholarship. It can be no trouble done by online means. As one log in the home page will appear on the computer screen. One needs to scroll down to the “Student Services” option. A new page showing all the student services will appear. One needs to select “Postmatric Scholarships for 2016-17”. The Application Form will open. All the details have to be carefully filled. After submission of the same, a new application form will appear. It should be carefully filled and submitted. On the next page, one has to enter the SSC pass type from the options provided. It will again carry over to the next page and the application will be completed. Documents have to be attached to the application properly so that the application is accepted. The documents pertaining to income, marks and gap certificate have to be attached. ied for having the scholarship must be eager to know the status of their application. It can easily be known whether the application is rejected or not through online means. To know the status online one need to be at https:// telanganaepass.cgg.gov.in. The following details have to be filled so that the position of the application can be known. So, no one knows all about having such a government scholarship. If one finds themselves eligible they need to apply. Telangana epass renewal, fresh pre-matric scholarship /post matric scholarship: Telangana epass scholarship application now Available to apply online. All those students who have all documents can proceed to apply online before the last date. But the last date of TS scholarship application not yet announced till now. As we already mentioned documents required for epass application online form for Telangana. But here we once again indicating required documents and application process. documents. 10th, previous year marks memorandum, cast, income from Mee Seva, passport photo, mobile phone, Entrance exam details like allotment order number. 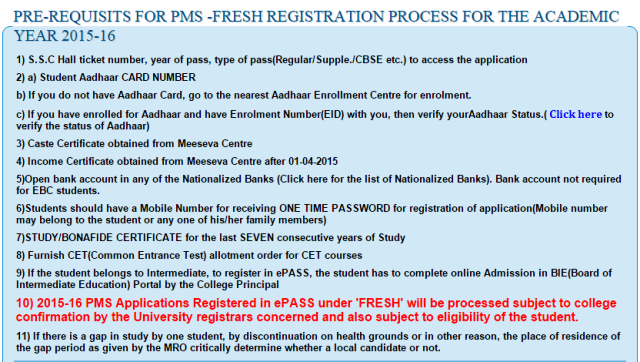 How to apply for epass Telangana scholarship renewal/ fresh? ont-family: Georgia, 'Times New Roman', 'Bitstream Charter', Times, serif; font-size: 16px; line-height: 24px;">For renewal, students can log on to telanganaepass.cgg.gov.in and-and click on students services, and then select post matric scholarship for renewal students 2014-15 academic year. and click on retrieve options to obtain your previous Telangana epass scholarship application details. ont-family: Georgia, 'Times New Roman', 'Bitstream Charter', Times, serif; font-size: 16px; line-height: 24px;">Residential details are including house number, street, Mandal / municipality, village/town, District /city, pin code and other, etc. Bank account details are bank account Number, Applicant Name with photo should be matched with Telangana epass scholarship name and the photocopy. Personal details include the Phone number, email Id and other, etc. Before your applying check instructions placed on telanganaepass.cgg.gov.in, and then click on tick mark on the box against documents like Uid (Aadhaar), bonafide, bank passbook, entrance exam allotted photocopy. If you have faced SSC details Not found Please contact district bc/ tribal welfare. The you have to go BC welfare office along with Original SSC and xerox copy, and epass application print out (if you have previous year not fresh) their epass staff can update to Telangana epass scholarship portal. Ok for applying for Telangana post matric scholarship online visit epass ts fresher / renewal do option on ts epass website. busy with getting income Affidavit in Notary and Taking Xerox copies at Xerox centers. The Internet centers with epass ts applications. Maybe ts epass server will be down today night or by tomorrow. If tsepass.cgg.gov.in extend the date, then the extended TS Epass 2015-2016 scholarship date will be 30th November 2015. (if they increase almost 99% choices to extend the ts epass ts renewal fresh application date. Happy to see you, friends. Telangana epass renewal, fresh pre-matric scholarship /post matric scholarship, epass ts fresh pre-matric scholarship /post matric scholarship. Telangana epass application form fresh renewal: Good news: Telangana epass scholarship application started now. Apply fast to avoid server load on Telangana epass website. All the guidelines and application requirements are available here. the last date is now 15/12/. b) If you do not have Aadhaar Card, go to the nearest Aadhaar Enrollment Centre for enrollment. c) If you have enrolled for Aadhaar and have Enrolment Number(EID) with you, then verify your Aadhaar Status at uidai.gov.in. 5)Open the bank account in any of the Nationalized Banks (Click here for the list of Nationalized Banks). Bank account not required for EBC students. 8) Furnish CET(Common Entrance Test) allotment order for CET courses. CET(Common Entrance Test) allotment order for CET courses. s website must have Aadhar card off. b)If you do not have Aadhar Card, go to the nearest Aadhar Enrollment Center for Enrollment. 2) In case of change of Bank account, open your Zero balance account in any of the nationalized banks (Click here for the list of nationalized banks). Bank account not required For EBC students. 3)The student should have a Mobile Number for receiving One Time Password for registration (Mobile number may belong to the student or any one of his/her family members). 4) Study/Bonafide Certificates for the last 7 consecutive years of study, for the student’s confirmation. 5.Study/Bonafide Certificates for the last 7 consecutive years of study. (For the students as referred at the point no. 4 above) . 6.Passed/Promoted Marks Memo of Previous year. 7.Original Income Affidavit (signed by the Student & the Parent) Download format for the affidavit. Note: If Any Problem in getting Password to Your Mobile, Go to nearest Mee Seva/eSeva/APonline Centers For Registering Without Password. go to telanganaepas.cgg.gov.in and click on students services. or you can directly click from here. 4.1 How to apply for epass Telangana scholarship renewal/ fresh?